Papaya leaf benefits are incredible for your health. Learn why and how to use them in this article! The benefits of papaya are well-known. This is thanks to their high antioxidant, vitamin, mineral and digestive enzyme content. The last is an essential ingredient of a healthy diet. However, papaya leaf benefits are also interesting for your health. Unfortunately, many people don’t know about these properties of papaya leaves. That’ why we’ll list all the papaya leaf benefits here in this article. Pay attention and consider including them in your diet. You can get rid of digestive problems like infections, stomach pains and heartburn with the help of papaya leaves. Its enzymes protect the entire digestive system from the mouth to the colon, and help proteins and carbohydrates break naturally to relieve the acid that forms in the intestine. Papaya leaves contain enzymes that help reduce the swelling in the body, as well as the fever, pain and flu associated with dengue fever. Dengue fever is caused by mosquito bites which are infected with the virus. It starts with a high and sudden fever (reaching 105 °F) between day four and seven after infection. From two to five days after the fever starts, a red, flat rash may appear on most of the body. Later, a second rash, which resembles measles, develops. People infected with dengue can experience increased sensitivity on the skin and feel a lot of discomfort. If you experience any of these symptoms, we recommend that you go to your doctor as well as use these leaves as part of your treatment. 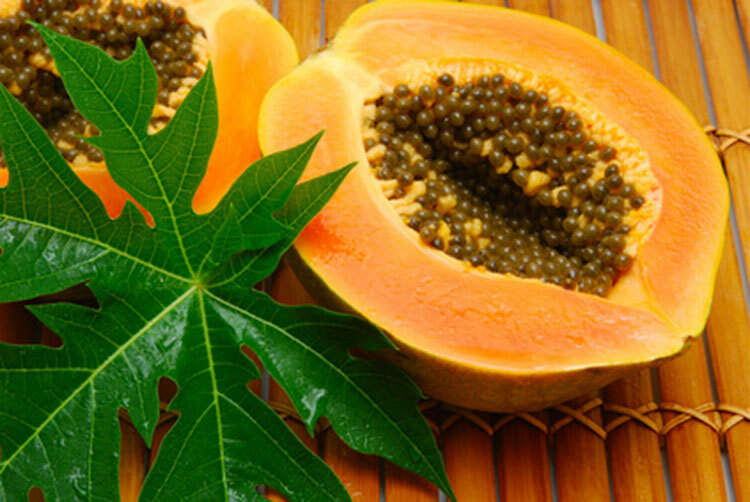 Papaya leaves will help your system break down the gluten protein and digest it better. If your doctor has told you that you are gluten intolerant, we recommend consuming an infusion of these leaves and visiting the nutritionist to make the necessary changes in your diet. The antioxidants in papaya leaves are extremely helpful in helping the body fight off diseases such as cancer without producing side effects. In addition to consuming this infusion at least 4 times a week, remember to have a more balanced diet. You should also quit smoking, do more exercise and avoid processed foods. When you consume a tea made of these leaves, it makes you crave foods high in carbohydrates and sugars less. This addiction is a serious problem that can cause you to binge eat, which negatively affects your health. We already know that papaya is an excellent laxative. However, if you don’t like the taste of the fruit, a tea made with its leaves can also help relieve constipation problems thanks to its large amount of fiber. To relieve the cramps and pains associated with menstruation you can drink the tea made from the papaya leaves several times a day. If you have hormonal or uterine fibroid problems, your menstrual periods are likely to be painful. In this case, try this tea to make your period more bearable without taking too much medication. If you suffer from some illness or are on a certain type of medication, it’s likely that you may lose your appetite. Drinking tea made from papaya leaves will help your body to have more desire to eat while improving the digestion processes. Now that you know all the papaya leaf benefits, it’s time to consume tea made from papaya leaves regularly to enjoy all these benefits! How to Get Rid of Dandruff – 5 Homemade Anti-Dandruff Recipes!